Nikki Grimes' poetry exudes warmth and hope, while acknowledging the trials and tribulations that life brings our way. 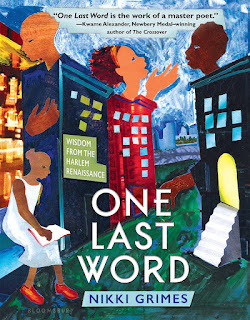 In this outstanding new collection, she shares poetry from the Harlem Renaissance and builds her own verse from it -- creating powerful, resonate poems that speak directly to today's youth. Grimes finds "fuel for the future" in the poetry of the Harlem Renaissance, pairing short poems from that era with her own original poems. She creates a multitude of contemporary voices, mostly of teens grappling with their hopes and dreams and struggles. In her opening poem, the young narrator asks, "How can I stay strong / in a world where fear and hate / wait outside my door?" Her teacher suggests that she seek out the poems of the Harlem Renaissance for inspiration and advice. Grimes then uses a selection of poems from this era to build her own poems. Using the Golden Shovel poetic form, she takes a key "striking line" from a poem and ends each line of her poem with one word from this striking line. Thus, her modern poems are intimately linked with the original. 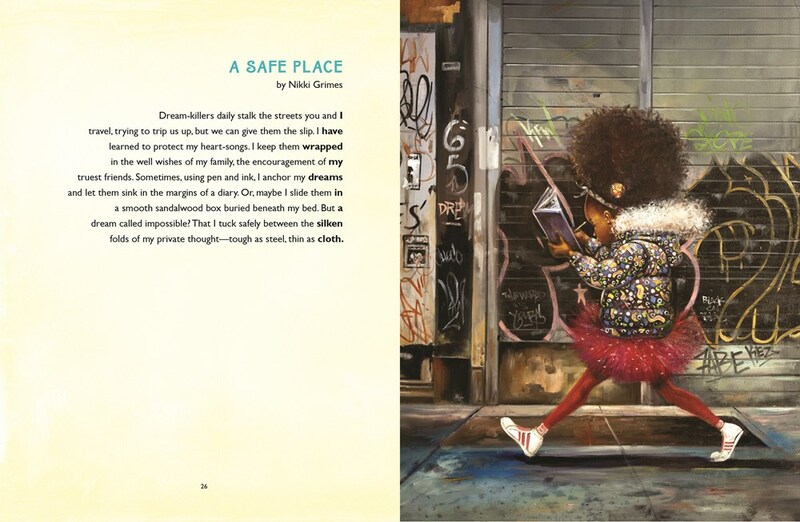 Each pair of poems is accompanied by a full-color illustration by leading contemporary African American children's artists, adding to the artistic interpretation of these resonate themes. Grimes spins classic poems to reflect modern sensibilities. Countee Cullen begins his poem "For a Poet" with the line, "I have wrapped my dreams in a silken cloth." From this, Grimes creates a modern character who uses poetry to hold and protect her secrets, as she navigates her urban neighborhood. 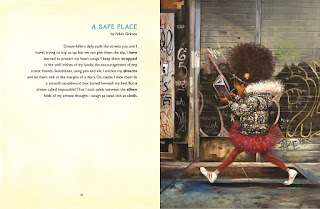 Frank Morrison illustrates this poem, showing a young black girl walking past a graffiti-covered wall, with her nose buried in her journal. The result will resonate with my students, helping them imagine themselves in these pages. learned to protect my heart-songs. I keep them wrapped..."
ours, right? We get to choose? Well, we choose life." Beginning with an introduction to both the Harlem Renaissance, Grimes provides both historical background and a personal connection to this era. Born in "the very Harlem from which many of their careers were launched," Grimes was well aware of the impact that poets like Countee Cullen, Langston Hughes and Paul Laurence Dunbar had. She helps young readers see the way that these writers reflected racial pride during this era. "Through the decades, this literature has reminded readers, of all races, how vital it is that we define ourselves, set our own paths, celebrate our own capabilities, and determine our own destiny, no matter what obstacles are placed in our way." Grimes acknowledges the weight of injustices and racial bias, but her voice rises strongly through this collection filled with hope and the assurance the poetry will help readers stand tall. "The past is a ladder / that can help you / keep climbing." Illustration © Frank Morrison 2017, poetry © Nikki Grimes 2017, shared with permission from the publisher. The review copy was kindly sent by the publishers, Bloomsbury Children's Books. If you make a purchase using the Amazon links on this site, a small portion goes to Great Kid Books. Thank you for your support.